As a new or existing home owner, you will most likely re-sell your property at some point in the future. Often, as properties age, their appeal can substantially subside. A facelift may be in order to help restore lost market value. The return on renovations has a great deal to do with the current market value of your home. Certain improvements can increase the value for some properties and be a complete misuse of time and money for others. Examine the charts below to see what improvements prove to be the most valuable investments for your home. Everyone wants to have the ultimate relaxation retreat in their home. A raindrop showerhead, glass steam shower and soaker tub are just a few mentionable luxuries. Upgrading a bathroom can produce a return on investment of 56% higher than the average renovation. A great bathroom that stylishly combines form and function will win over buyers. It’s where the whole family and your guests want to be. Whether you’re cooking for 2 or 10, or refueling on the go, it’s a space that needs to meet your needs. That’s why kitchen upgrades can produce a return on investment of 44% higher than other home improvements you might consider. Appliance upgrades are a key factor in kitchen renovations. Brand name stainless steel appliances become an attractive feature for home buyers. Upgrades like maple wood cabinetry and granite countertops are always impressive choices. Brushed stainless steel hardware and plumbing fixtures add the finishing touches to any contemporary kitchen renovation. Painting, a fairly simple and inexpensive update, is so often overlooked for its remarkable effect. It adds depth and cohesiveness to any room, by completing a look and accenting furniture. 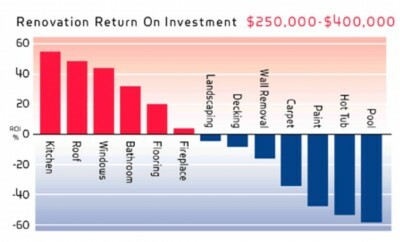 Expect a return on investment of 29% higher than other home renovations. Try neutral tones of beige, brown and grey; they compliment almost all furniture types. Keep bold colours for your décor pieces like pillows, throws and room accents. Most new home buyers despise having to repaint an entire home to suit their style, so keep colours neutral. Hardwood or tiled floors in a home can have a great impact on home appeal. It adds a modern flair to any home, if the right choices are made. Maple hardwood, slate tiles, laminates or ceramics can add elements of texture and dimension to open up any space. Flooring upgrades can produce a return on investment of 22% higher than the average home reno. To achieve a more contemporary look, choose dark colours for hardwood and tile. It creates a more polished and sophisticated look. Also, draw attention to floors with interesting rugs that flatter. Warming up by a fire can make even the worst winter weather seem bearable. The ambiance of a fireplace fills any room with a warm and comfortable glow. 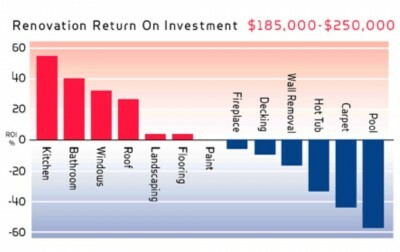 If you’re looking to install or upgrade a fireplace in your home, expect a return on investment of 11% higher than other home improvements you might consider. Gas fireplaces nowadays are the most popular choice; with greater efficiency, ease of use and maintenance than their more traditional wood burning counterpart. Styles range from a more traditional hearth to ultra modern stainless steel. Choose a contemporary design to satisfy any design style. Making a good impression on a potential home buyer starts from the outside in. Landscaping the front and back of your property is a relatively inexpensive way to breath new life into an average home. Landscaping can provide a return on investment of 7% higher than other home improvements you might consider. Creating curb appeal can be easy and affordable. Placing potted plants, flowers, trees or shrubs at the front entrance of a home creates an inviting ambiance that frames your doorway. Polish up a tired backyard with a natural stepping-stone pathway, pond or flowering shrubs. A fountain and small bench can also add just enough elegance to create a cozy outdoor retreat.